TBF: Can you please elaborate on the connection between the The Best Friend’s Peace Campaign and the monks and freedom movement? 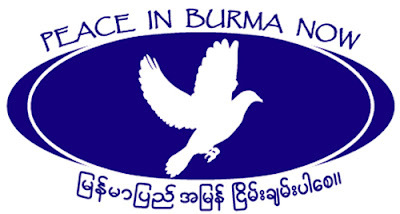 Ashin Kovida: The Peace in Burma Now stickers are very nice. Burmese monks are traditionally and historically associated and connected with non-violence. When they are involved in political matters and in helping the people, this is non-violence. This is peace. So in this way, peace is connected to monks. I believe, that everybody who wants peace will be happy to hear about Garrett’s actions. Everybody who really wants peace will want many people to do something like this. Something like Garrett has done. TBF: What are you trying to achieve with the Peace stickers? Ashin Kovida: The main goal of these stickers is to show we want peace in Burma. And everywhere else in the world. We want to achieve peace in Burma. We want everybody to be united. Everybody is responsible to achieve peace and tranquility in Burma, mostly the government itself. But look what they did: they deported Garrett, somebody who wants exactly the same. This is very shameful for Burma and the military regime. Garrett Kostin wants to see peace in Burma and help the Burmese people. This is a very noble thing to do. TBF: Is this the right time for actions like these? Ashin Kovida: Now is a good time for actions like these. The junta also claims to want peace. They keep announcing in their newspapers they want tranquility and peace. In their roadmap to democracy, with the elections. We have to test if they really mean this and really want peace and democracy in Burma. There is no evil in wanting peace. There is no evil in wanting democracy. TBF: You have said you believe that ‘we need more tourists like Garrett’. Can you explain this and do you think tourists who visit Burma are in some way obliged to do something? Ashin Kovida: I am really proud of what Garrett Kostin did inside Burma. He put up many stickers, which is brave and great. We need many tourists like him to show they support peace, freedom and non-violence. It’s like Daw Aung San Suu Kyi’s quote: ‘use your liberties to promote ours’. I feel tourists and everybody, even Burmese people have a responsability to support freedom and democracy in Burma. TBF: How can tourists do something? Ashin Kovida: They can do like Garrett did: speak with the people, both inside and outside. Show them you want peace in burma. The junta has announced elections for this year and keeps on talking about their 7-step roadmap to democracy: by saying you want peace and democracy you don’t do anything wrong, because they say it, too. Just test them. Test the regime. Are they serious about their calls for democracy? Then why do they arrest people who call for exactly the same? TBF: There have been some reactions on the internet about Garrett’s actions: some people feel his actions are irresponsible and may have endangered local people inside. What is your opinion about this? Ashin Kovida:I believe everybody is free to his or her own opinion. It was even like that in the time of the Buddha: not everybody supported him. People have different opinions. You must have your own intention. Garrett’s is, that he wants peace in Burma. I do not blame anybody who wants peace in Burma. I understand people worry about how these actions may have put Burmese people in danger. Garrett tries to sacrifice to some extend for Burma. I request everybody who wants peace in Burma to do something like him. As long as the junta is there, people’s lives are in danger. They are not only in danger because he put up peace stickers. Ashin Kovida:I agree 100% with this! The Buddha said: if you see the right, you must accept right as right and wrong as wrong. You must be ready to say it’s wrong when you encounter injustice. You must have the courage to speak out. Albert Einstein said that the world we live in is dangerous, not because the people do bad or evil things, but because of the people who support it and ignore it. We must be ready to speak out!